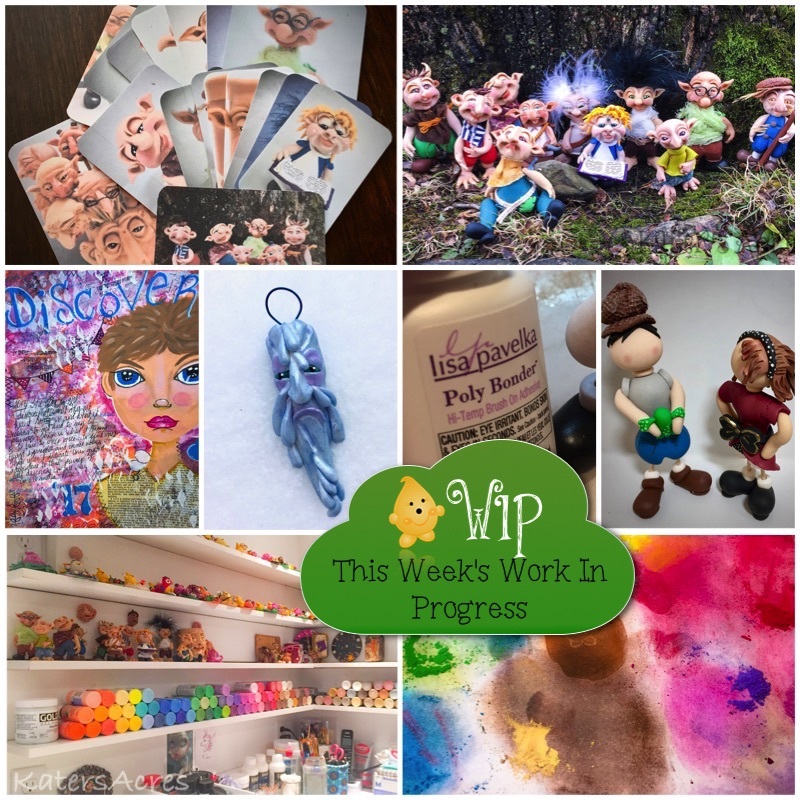 Do you like behind the scenes pics, WIP (work in progress pics), and other such miscellany? Then you need to follow me on Instagram. Do you like Project Life, do scrapbooking, or like to add tip-ins into your journal? Why not make your own Project Life cards using your artwork? I did that this past week. These are sure to be a source of inspiration for my journal. The ‘Schrumes are happy little elvish troll fellows (and a few ladies) who live deep in the forest. I’ve received lots of questions regarding them lately. Yes, they are available for adoption. You can get them here. My word of the year is “Discover” and this is my art journal page and self portrait (well, kind of), inspired by LifeBook dedicating 2017 to this cause (more on this in a future post). The snow has hit us this week in NW PA and I’m so happy for that. But there are parts of the country that are NOT happy with all their snow. This little melting icicle reflects that. I’ve had quite a bit of fun making a bunch of these. You can learn to make your own here. Do you ever find that some week’s there’s that one product you can’t stop using. This past week it was Lisa Pavelka’s PolyBonder. If you’ve never used it, it’s great stuff! Want to learn to make your own little Toothpick Kids? In February, Parker’s Clayful Tutorial Members will explore how to make these Toothpick Kids and how to balance them and give them personality and character, all without adding ANY facial expression. Trust me, it’s harder than it looks. Last but not least, where would I be without my lovely chalks. My love affair with using chalks to shade the faces I make in polymer continues. COMMENT BELOW: What has inspired you this week? Is it an underused supply? Is it a newly sculpted piece? Let us know in the comments below. Check out StudioMojo, a paid monthly subscription eZine that delivers every Saturday to your email. Don’t miss this FREE Valentine’s Day Sweater Heart Pin Tutorial from our archives. It’s week 5 of the #2017PCChallenge and it’s not too late to join the fun. Come on over and join the 2017 Polymer Clay Challenge. Scott Publications is closing Polymer Cafe Magazine. Read the details here. Don’t miss Teresa Pandora Salgado’s Steampunk Cuff Bracelet Video Tutorial here. Debbie Crothers new, highly anticipated Swellegant veneer tutorials are available now and are discounted through the end of February. On a personal note: This year I’ve made it my mission to DECLUTTER the house. Yep, you read that right. So far in January, I have taken two car loads and donated items to the homeless, local library, local shelters, and goodwill. We don’t believe in items going to waste; anything that could be donated, we made sure was. It’s starting to feel good to declutter our home and life.